You need good publicity to promote your production (or product, project or company). You can't afford a publicist. Where do you start? 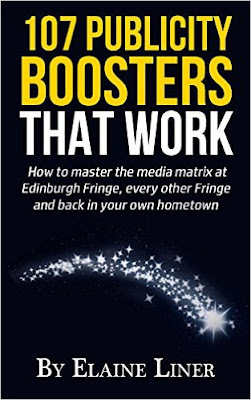 Author, veteran arts journalist and solo performer in her own right, Elaine Liner lays out 107(+) tips, strategies and insider secrets that tell you exactly who media are, what they want from you right now and how they want it. The book is targeted to performers heading off to the big Edinburgh Fringe, but apply to promoting yourself at venues and festivals pretty much anywhere. "Since email is your first line of attack in reachng media, address each one personally and personably. Do not gang-blast the same story pitch/release to everyone on your media list." "If you have an idea for a story pitch while you are out and about, email it to yourself." "Do NOT send the same photo to everyone." This podcast about Canadian indie and fringe theatre, Stageworthy, hosted by solo performer Phil Rickaby, is great. This first episode is chock-a-block full of little tidbits of marketing and PR wisdom about taking a solo show to the Edinburgh Fringe. So good to hear about how Rebecca Perry went about producing and promoting her show in an international market. Also, especially nice to hear how professional she approaches her production, fringe or not.